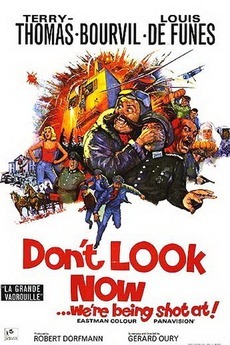 released in the United States as « DON’T LOOK NOW… We’re Being Shot At! » is a 1966 French comedy film about two ordinary Frenchmen helping the crew of a Royal Air Force bomber shot down over Paris make their way through German-occupied France to escape arrest. For over forty years La Grande Vadrouille was the most successful French film in France.